Right this moment the worlds media is bursting proverbial blood vessels at happy news of the safe arrival of the Royal Baby. It's a boy! Welcome to the world tiny one, stay small for as long as possible! We can expect wall-to-wall coverage of the new parents every move/outfit/ under eye bags and of course now the wait for the first baby photo will begin. Exciting, if a bit mental. Whilst I share in the excitement of the new mini monarch I wanted to take a moment to talk to you about some other kiddo's who also deserve a fuss. In a few weeks time my little (25 yr old!) sister, Brigid, will be heading off to Romania to spend her summer working in one of the countries many orphanages in conjunction with the charity, Future Sense. Many of these children will have never known life in a family home and don't experience the luxuries most children (and grown ups) here in the UK take for granted. Future Sense and its volunteers work to improve the well being, living conditions and prospects of these children and many others around the world. This Summer the children's bathroom will be refurbished, the volunteers will also spend quality time with the children, from activities and local trips out to just hanging out and reading a story. All volunteers fund raise before setting off and Bridge is getting really close to making her target! So, im holding a giveaway with a difference. I'm asking Four Little Wall's readers, if they can, to donate what ever you are able towards Brigid's Future Sense fund! 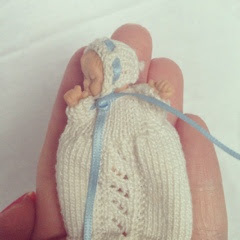 As a thank you for your generosity anybody that donates will be entered into a draw to win this tiny, sleeping, baby doll. He's dressed in a hand knitted (NOT made by me!) gown and bonnet. He has even got a little cotton nappy. Sweet. Make sure you leave a comment on this post once you've donated so I don't miss anybody from the draw! I hope Brigid will be able to share some of her Romania experience with you when she gets back at the end of the summer and I'll keep you updated in the mean time! I can tell you in advance that she's squeezing a doll's house into her suitcase, well we couldn't NOT send one could we? !